Ivory Coast or Côte d'Ivoire, officially the Republic of Côte d'Ivoire, is a country located on the south coast of West Africa. 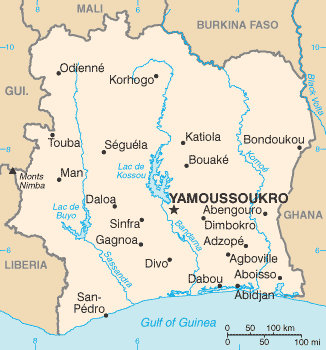 Ivory Coast's political capital is Yamoussoukro, while its economic capital and largest city is the port city of Abidjan. It borders Guinea and Liberia to the west, Burkina Faso and Mali to the north, Ghana to the east, and the Gulf of Guinea (Atlantic Ocean) to the south.